Hans Rosenström, Shells Within Shells, Anatomy Of Political Melancholy, Athens Conservatory, 2019. Photo courtesy of the artist. We proudly announce that Future Delay, an exhibition curated by Amanda Schmitt will be on view at Helsinki Contemporary June 7 – July 7, 2019. The exhibition will center around newly commissioned works by Madeline Hollander, Pearla Pigao, and Hans Rosenström. Future Delay is made possible by the Finnish Cultural Institute in New York through its MOBIUS Fellowship Program and Helsinki Contemporary through its Guest Curator Program. Additional support is provided by HIAP – Helsinki International Artist Program by hosting Madeline Hollander's residency in June 2019. 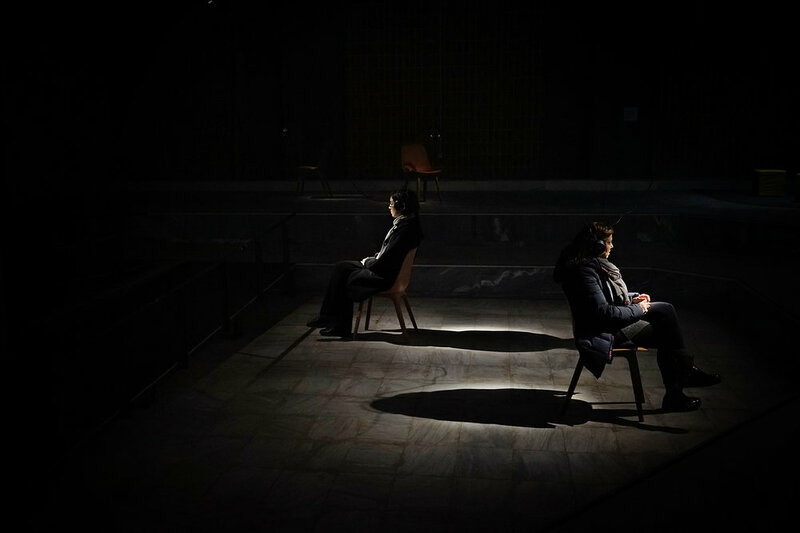 Pearla Pigao, Sinus X DèleonCompany, 2018, Performance for CHART, Shown at Design museum Denmark. Photo: Christian Hoyer. Future Delay departs from the work of media pioneers and theoreticians Paul Ryan and Erkki Kurenniemi who dedicated their careers to exploring cybernetics and positing the future potential of technological immortality, mobilizing their experiments through the work of three contemporary artists. Madeline Hollander will work in tandem with local dancers to present a choreographic performance that will take place in the gallery throughout the month (schedule to be announced in May 2019). Pearla Pigao will present a sonic sculpture that reacts to the movements of the visitors to the gallery. Hans Rosenström presents a multi-channel, binaural sonic installation. Both works by Pigao and Rosenström will be interactive and will invite the viewer's participation. Technology today promises a stare into the abyss of death but with a happy ending. The exhibition, along with its accompanying text and related programming (to be announced at a later date), asks us whether technological immortality can replace biological mortality. What would future delay appear as, and how would interference and synchrony between transmission and reception in both organic and technological beings manifest? Are humans choreographing a future integrated with machine, or are the machines choreographing us? Future Delay is a culmination of Amanda Schmitt's MOBIUS Fellowship and participation in Helsinki Contemporary's Guest Curator Program. Supported by the two programs, she traveled to Helsinki for the first time in February–March 2018 to familiarize herself with the local contemporary art practitioners and partner organization Helsinki Contemporary. Madeline Hollander, New Max, The Artist's Institute, 2018. Photo courtesy of the artist and The Artist's Institute. 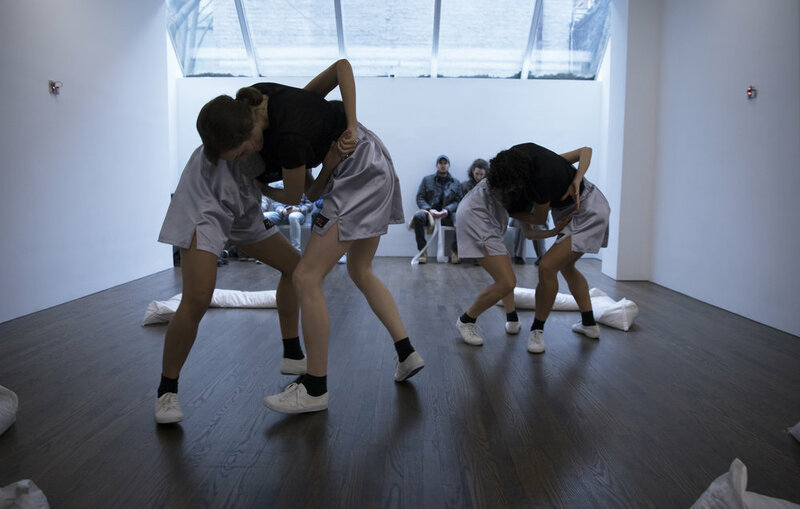 Madeline Hollander is a New York-based artist and choreographer who works primarily with performance and video to explore how human movement and body-language negotiate their limits within everyday systems of technology, intellectual property law, and mass-culture. Forthcoming projects and exhibitions will be presented at the Whitney Biennial, The Whitney Museum, New York and The Shed, New York. Pearla Pigao is an Oslo-based artist, musician, and craftsman. Drawing on her background in both music and textile art, her work explores the relationship between sound and material, drawing on the commonalities between weaving and musical composition to create digitally hand-woven textiles that create visual, tactile experiences of sound structures. Amanda Schmitt is an independent curator focusing on video, sound, performance and time-based media, with a core interest in analog technologies, and has curated over 50 exhibitions, video screenings and performance series since 2006. Schmitt has held director positions at New York galleries including Marlborough Chelsea, SIGNAL, The Hole, and Horton Gallery, and is currently the Director of Programming and Development of UNTITLED, Art. as well as the host and producer of the UNTITLED, Art, Podcast. MOBIUS Fellowship Program, launched by the Finnish Cultural Institute in New York and the Finnish Institute in London in 2014, aims on bringing together visual arts professionals and organizations through international work periods and thematic projects on both sides of the Atlantic. The program is supported by the Kone Foundation. Through their Guest Curator Program, Helsinki Contemporary invites annually an international curator to realize a project at the gallery. The aim of the program is to present a bold international exhibition showcase in Helsinki, to introduce a new content viewpoint to the gallery's program and to support the work of artists represented by the gallery.